Urnas is a desert world with a very thin, tainted atmosphere. The system has a population over one billion. This world designated as an Amber Zone. Caution is advised since the world has an environment, laws, customs, life forms, or other conditions that are not well understood and might be a danger to a visitor. It is a member of Third Imperium in the Pretoria Subsector of Deneb Sector and in the Domain of Deneb. Urnas, as a member world of the Third Imperium, holds the estate of an Imperial knight and the feifdom of a count. Both are members of the Imperial Nobility charged with overseeing the world. This world contains an Imperial Scout Base, capable of handling Scout Service starships and personnel. 20% of the world's population is the Human Chimera Jonkeereen. Urnas is a desert world with a very thin, tainted atmosphere. The system has a population over one billion. It is a member of Regency of Deneb in the Pretoria Subsector of Deneb Sector. This world contains a Regency Scout Base, capable of handling Scout Service starships and personnel. 20% of the world's population is the Human Chimera Jonkeereen. The planet is a cold world one orbit outward from the habitable zone. Urnas has a balkanized government with many different nations, but two great powers. Theocratic Sulan is the larger with a population of 1.1 billion but technocratic Kasame Upu Uluriri with 0.7 billion has the edge in technology. The two have been locked in direct conflict and proxy wars for generations. Sternmetal Horizons operates extensive facilities at Urnas. Ling-Standard Products is also active here. This system is located on the L'sis Main. Urnas was settled by mining companies in the late 200s, hoping to exploit the world's rich mineral deposits. About 400,000 years ago, a large nickel iron meteorite slammed into the mostly silica composed Urnas, and accretion from this collision created a massive shatter belt of heavy metals and minerals ringing the middle latitudes of the world. This leaves the middle of the world much darker in color than the poles. While these resources were quite valuable, the depth of the belt and severe disruption of the adjacent country rock forced the settlement to be built at the poles. In the north the city state of Veito was built by one mining group, and at the south the city state of Nanshyn was built by another. The core of these communities were the huge water reservoirs excavated over a period of several hundred years to keep up with the expanding communities, and filled with water collected and processed from cometary debris. Between these two cities parallel tunnels were dug into the Black Belt, often sprouting communities of their own in the wake of mining operations. The miners and their cities were not able to process much potable water for life support or mining operations, and were very much reliant upon the pole reservoirs. As industry began to replace mining income for the two cities, commercial competition became the grounds for real conflict. Rather than directly compete, the cities used their money and water monopolies to compell the miners to form proxy armies that fought on the surface or in the tunnels. Where the two sides communities and forces came close to each other, vertical and sloping tunnels were dug in a twisting three dimensional labyrinth to either avoid or confront each other. The cheap flow of weapons from the polar cities guaranteed slow social breakdown through the centuries, and by the 1000s the world was an Amber Zone. The polar cities ensured that no competing industry would develop among their thralls, manipulating factions to attack any machinery or plant that could conceivably threaten the status quo. 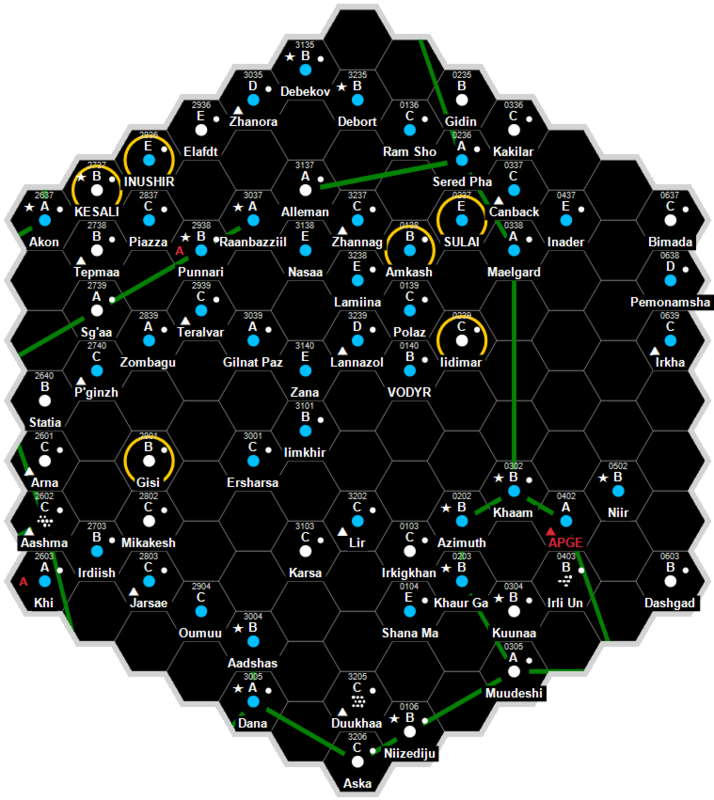 The Imperial Civil War and subsequent Vargr raiding led to a temporary truce, and the Domain of Deneb flooded the world with Army troops in an effort to create disengagement zones. After the Collapse, the world was included in the Industrial Development Program, and some of the equatorial factions were able to break free of the poles charged influences. But it was actually the arrival of Vargr Ksonotso refugees from coreward and their money and work ethic that finally broke the pole monopoly. Numbering just a few hundred thousand, these refugees were offered shelter at an equatorial community under Regency Army protection known as Sabalberg, where they invested their money in infrastructure and schools. The world is now divided into three main coalitions: two that are still heavily allied with Veito and Nanshyn, and the growing influence of Sabalberg. In truth most local states are still heavily armed and suspicious of each other. Travel is still made difficult by various security and "border" checkpoints between underground communities. Surface travel links are poorly developed, and travel through the massive Underground is difficult without paid guides or updated navigation files, both of whose accuracy is often compromised by local patriotism and secrecy. Offsetting this intercommunal hostility is a genuine obsession for offworlders and their goods, and in most cases it is not that difficult for travellers to seamlessly journey through the Underground if they take an effort to ingratiate themselves and respect local customs. Nasans (as the call themselves) are heavily tattooed to identify their factional affiliation. Despite steady improvements in local conditions, the population prefers their cramped living quarters, and agoraphobia afflicts many people who have never visited the surface or other worlds. In many communities preteen children are taught weapon skills and indoctrinated in locals claustrophilic prejudices. A few are able to advance to university training at Sabalberg or the polar cities, and graduate to work for Regency corps at the starports or offworld concerns, but they generally leave behind their local communities, leaving their stubbornly embittered and smoldering kin behind. Dave Nilsen. The Regency Sourcebook (Game Designers Workshop, 1995), 52. This page was last modified on 23 August 2016, at 23:12.